We just welcomed in the Christmas season with the annual Santa Claus Parade in Banff. We met Santa in person on top of the Banff Gondola, and we did our first winter ice hike to see the frozen falls at Johnston Canyon. Last year, I did two separate "Gotta do THIS" posts, one for December, and one for Christmas. This year I am combining the two into the same post, focusing primarily on holiday fun to enjoy with your family this coming month. We have several favourite holiday events that we attend annually as a family. Then there are always new events that we discover each year - ensuring our calendar stays nice and full. Add a few to your own calendar and make some fun memories this season. 1. The CP Holiday Train - This beautifully lit up train travels across Canada each December collecting donations for local food banks and spreading holiday cheer with live entertainment. A stage opens out of one of the box cars and it's always a big party with kids dancing in front of the colorful train. We like seeing the holiday train in Airdrie so that we can go to the Airdrie Festival of Lights at the same time and take a ride on one of the miniature trains. And if you want to make sure the reindeer will be there for your visit, I'd recommend contacting the Bragg Creek and Area Chamber of Commerce in advance. The reindeer might not be there until the second weekend. 3. The Lion's Festival of Lights, Confederation Park - The 31st annual Festival of Lights runs nightly from December 2nd until January 8th in NW Calgary. While you can just park near the gates and walk in to see the lights, we like to park over by the Confederation Park Golf Course off Collingwood Drive and then we like to ski or hike across the golf course. 4. Zoo Lights at the Calgary Zoo - This popular event is back until January 6th and I recommend going early! By 7:30pm it's so crowded you can't move in the park and the line up to buy tickets is insane! Yes, you can use your seasons pass to go earlier in the afternoon, visit the animals, and then just stick around for Zoo Lights. They do not kick you out. In fact, the cafeteria is kept open so you can go in and have dinner (and thus, you are still supporting the zoo by buying something, and not just sneaking in for free. We usually buy cookies and hot chocolate as well.) - And yes, I can confirm all of this because we just visited Zoo lights last weekend. If you don't have a seasons pass, you can still go earlier in the day, pay for regular admission, and then stay for zoo lights. Yes, it is more expensive to buy regular admission rather than paying for zoo lights, but you get to see the animals and the lights for one price - and you get early access to see the lights without the crowds! If you have a seasons pass with parking connected to it, you do not need to pay for parking at zoo lights. You can park in the zoo lot at any time with your Calgary Parking Authority registration. We went to zoo lights last Sunday at 3:30pm with our annual passes. We visited all of our favourite animals, had dinner at the cafeteria, and had the whole park to ourselves. AND the lights were on by 5pm. By the time the park started to get busy, we were on our way home. We skipped the Santa visit this year but he was in the conservatory at 6pm ready for visitors. 5. Mountaintop Christmas at the Banff Gondola - Free with your admission to the Banff Gondola, you can visit with Santa, decorate Christmas cookies, make a craft, and participate in a fun family scavenger hunt. Take a tour of the interpretive centre, watch a great Disney movie in the theatre, have lunch in the cafeteria, and take a walk on the boardwalk trail to the top of Sanson's Lookout. And for those on a budget, you don't have to pay to ride the gondola down in the winter if you hike up. The trail is pretty snowy right now though so if you plan on hiking up the 700 metres of height to the top of the gondola, bring spikes or ice cleats for traction. I also recommend checking the Banff Trail Report for the Sulphur Mountain Trail because sometimes the trail can be closed. For more information, read the story I just wrote: Celebrating a Mountain Top Christmas in Banff. 6. 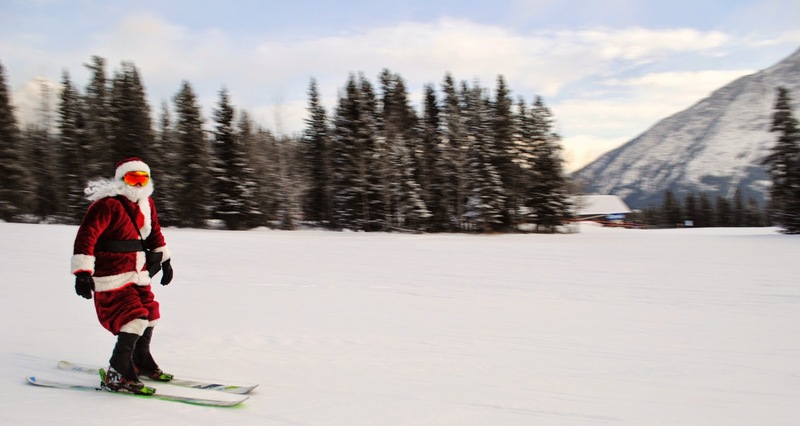 Ski With Santa at Nakiska Ski Area - Watch out for Santa on the slopes at Nakiska Ski Area between December 23rd to the 25th. And, you can try luge in the ice house, included with your paid admission, if you pre-register. I'd register soon as this is bound to be popular! And, while you're at Winsport, you should definitely try tubing as a family! Heated bathrooms and a snack/coffee bar right at the base of the sliding hill! You can warm up with a hot chocolate or coffee without having to return to the main building. Large family tubes that can fit up to four people in one tube! We like to spend the weekend before Christmas at a remote wilderness hostel in Kananaskis or Banff and have been doing this for several years now. We go skiing, snowshoeing, skating, and play in the snow with friends. Some years we've made gingerbread houses and other years we've exchanged a few presents. Below are some of my pre-Christmas wilderness hostelling stories if you'd like to be inspired to try this yourself. Have a bigger budget and want to spend a few nights in the mountains this Christmas? Below are my top picks for where to spend a truly magical Rocky Mountain Christmas. With ski or hike in/out cabins on the lakeshore, Emerald Lake Lodge is a great place for active families wanting to play in the snow without going far from their hotel room. Families can ski or hike across the lake, ski or hike the circuit around the lake, or ski/hike on numerous other trails in the area. The resort has a great outdoor hot tub as well and the dining is some of the best in the Rockies. It can be noted too that the last time I stayed here, I proclaimed that camping was stupid and that I was born to be a princess within the first 5 minutes of arriving. So take mom here and treat her like a princess for a couple of nights. For more inspiration check out this story I wrote after our stay last year: Family Weekend at Emerald Lake, Yoho National Park. One of our favourite places to head for a day trip before Christmas is Kananaskis Village (and if you can stay overnight at the Delta Lodge it's even better!) We go cross country skiing or hiking at Ribbon Creek, go downhill skiing at Nakiska Ski Area, skate on the outdoor pond at the village, visit with the reindeer (they'll be at the Delta Lodge this year on the 24th and 25th,) and hang out inside the lodge by the beautiful fireplace. If there's one place I've truly fallen in love with over the years, it's Mount Engadine Lodge. We've stayed here numerous times (winter and summer) and have always had an extremely memorable stay. Don't have the time, budget, or energy to plan an overnight trip right before Christmas? You can still round up your Santa hats and head out for a day hike. Check out our photos from last year's Christmas hike in Johnston Canyon in this story. We love going away for New Year's with friends and sharing a cabin or condo so that we can celebrate New Year's Eve with the kids during the daytime but then continue the celebration after the kids have gone to bed. We love going to the Columbia Valley in BC for New Year's. There are fireworks on the 31st in the Town of Radium Hot Springs and there's no shortage of things to do in the valley! Go Skating on the Lake Windermere Whiteway - When frozen, the lake has a giant oval cleared for skating with groomed ski tracks created around the outside of the skating loop. It is the longest skating trail in the world at over 30 km in length. There are also several hockey rinks cleared on the lake and fat biking is another popular sport enjoyed by locals on the lake. Spend a day at Panorama Mountain Resort - We plan to spend a weekend downhill skiing at Panorama in January and are super excited to try out the hill. Aside from downhill skiing, there are plenty of other activities to try at the resort as well. We love coming here for a day to go cross country skiing up to the Hale Hut. And this past winter, we tried fat biking! Read more about our fat biking and cross country skiing experience last winter here: Panorama Mountain Resort - much more than downhill skiing. You can also go cross country skiing or skating on Lake Lillian, just outside the Town of Invermere on your way up to Panorama. The Toby Creek Nordic Centre grooms and maintains a ski and skating loop on this lake. 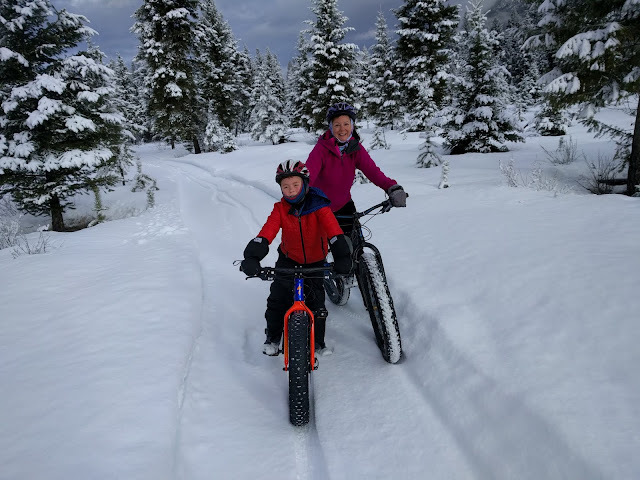 Go Cross Country Skiing or Fat Biking at Nipika Mountain Resort - Located a short drive from Radium Hot Springs, we love coming here for a day to ski or bike . The Natural Bridge is really cool to ski to and we like doing the loop to return via the Canyon Bridge. There are also warming huts spread out around the property which makes for a family-friendly way to ski with young children. Read my story, Everything for a Family to Love about Nipika Mountain Resort, to learn more about skiing here. And, while you're at Nipika skiing, rent some fat bikes and take them out for an easy spin around the south trails. The resort also rents kids' fat bikes (they have one 20" bike and one 24" bike.) Go early if you want to claim one of the two kids' rental bikes. Fat biking at Nipika caused me to fall head over heels in love with the sport and I now want my own bike. Read more about our experience last winter: Our Newest Obsession - Family Fat Biking. Have a great Christmas season everybody and make sure you're following me on Instagram to follow all of our holiday adventures. Some of them will be a little less snowy than normal for this family in December.